The Vancouver Sun Run is a great excuse to stick to your fitness goals. On April 14th, this popular race will return, making the festive 10km run one of the largest in North America! 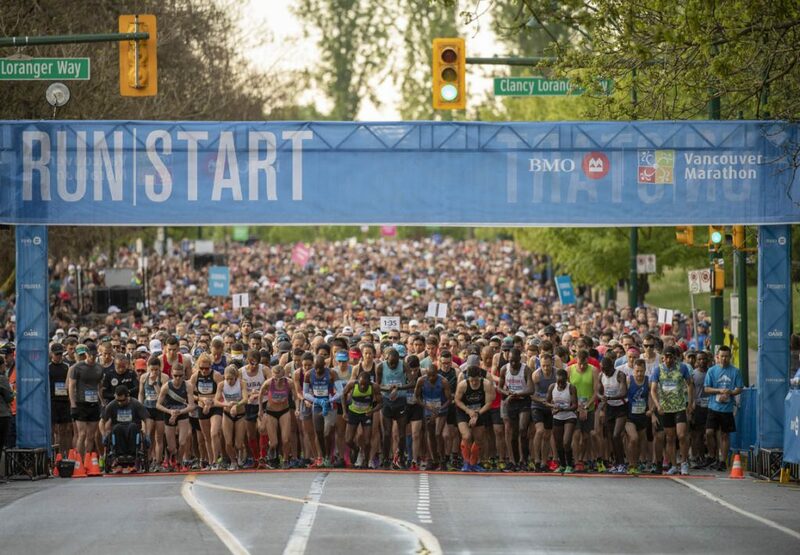 Attracting almost 50,000 participants each year, the city route goes from the heart of downtown, through the West End, over the Burrard Street Bridge, and ends in BC Place Stadium. One of the many great things about this run is all the live music that is stationed along the route, not to mention the spring weather which is usually crisp & perfect. Along with the 10km course, you’ll also have the option of walking or taking a shorter 2.5km course, PLUS there’s a wheelchair division! As an exclusive offer, StayVancouverHotels is giving away free VISA e-cards for those who participate in this fun-filled event. To learn more about how you can get your own personal VISA e-card, please refer to our Vancouver Sun Run promotion for details. Unable to attend the Vancouver Sun Run? Not to worry, we have you covered! The BMO Vancouver Marathon on May 5th is rated as one of the top travel destination marathons in the world – certainly worth training for! The route takes runners along iconic beaches, parks & the world-famous Vancouver Seawall. Runners will also enjoy spectacular mountain range views of North Vancouver, along with the lush greenery of Stanley Park. As an alternative to the full marathon, there are options to sign up for a half marathon, an 8-kilometre run or the kids’ run. For a limited time, we are offering BMO runners the chance to win free entry to the marathon through our giveaway, along with a $75 VanPass voucher. Check out our BMO Vancouver Marathon promotion for additional details on this exciting offer. Finally, the SeaWheeze Half Marathon will be the perfect run once the middle of 2019 approaches. Held on August 17th, this part half marathon, part weekend festival will include: tons of music, delicious food, yoga & collectible swag. The 21km run will begin in downtown to Kitsilano, followed by Stanley Park and all along the picturesque Seawall – the world’s longest uninterrupted waterfront path. It’s an absolutely stunning run & it’s no wonder that people from all around the world fly to Vancouver just to participate in this fun half marathon! Make sure to book your hotel accommodation early to not miss out & do take advantage of one of our exclusive offers before they are gone!